Minnis Government on the ropes after just 22 months in office…poor decisions and bad judgment have caused support for the Minnis Government to collapse! Nassau, Bahamas — Political winds are behind the Progressive Liberal Party now under the new direction of Party Leader Philip Brave Davis. If you don’t believe us, just take a look at the latest BBB Analytics poll, which puts the Leader of the PLP ahead in Strength and Trust. For the last 20 months, Bahamas Press has warned the FNM insiders that something is turning demonstrably and dangerously hard against them on the ground, and latest numbers now place the PLP Leader even further ahead! Anyone from the Churrin at Sybil Strachan Primary School to the taxi drivers, nurses, doctors, straw vendors, BTC, BPL and WSC workers would all agree that something has gone terribly wrong inside the Minnis Government. Unemployment is up to 10.8% [and that is being kind]. Discouraged workers are up, crime ain’t being reported, healthcare is in shambles, the deficit is growing, the national debt is increasing, layoffs abound, and home foreclosures are happening by the day! Not to mention the thousands of disconnections [water and light] due to the serious collapse of funds in homes all around the country. Bahamians are hurting. Social Services is in a mess with no vision to reform and uplift the poor. Programmes like Rise have been cancelled, throwing thousands off the breadline in the infancy of the FNM government. But today the numbers are showing up high in favour of Philip Brave Davis Q.C. and his organized PLP. They are mapping out plans to lead a government on day one. This spells “trouble” for the governing Free National Movement if they keep taking advice from a group that has failed to deliver one solid programme or project for the growth and development of the Bahamas! With some 3,000 respondents taken from households across the country, the Minnis Government can begin packing their political bags. When asked: If an Election was called today which political leader would you trust to lead the Bahamas? 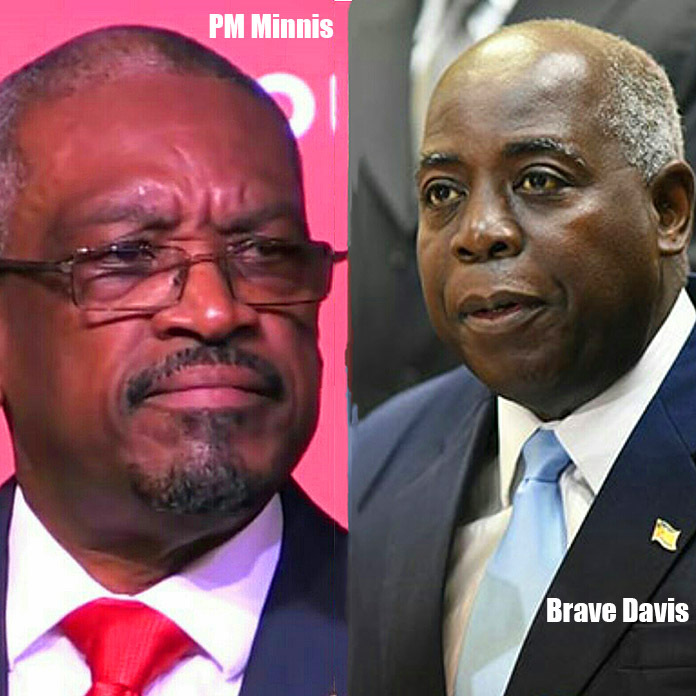 With a Margin of Error ± 3.1, a whopping 80% supported Philip Brave Davis to lead the government, 12% MOST HONOURABLE EVER Hubert Minnis, 1% say they will support a third party and 7% polled were unsure. When asked: Which Political Leader do you believe would have a Strong Hand when dealing with national matters? Again with a Margin of Error ± 3.1, some 82% supported Philip Brave Davis, 8% MOST HONOURABLE EVER Hubert Minnis, 10% polled were unsure. On questions that suggest Likeability – again with a Margin of Error ± 3.1, some 61% polled for Brave Davis, while just 14% for MOST HONOURABLE EVER Hubert Minnis and 25% for polled were unsure. When asked: How would you classify the performance of the Government to date? Excellent, good, fair, or poor? Again with a Margin of Error ± 3.1, some 9% classified the performance as excellent/good, 6% only fair and 85% cited the performance of the Government to date as poor. This is not looking good for the FNM. The early numbers are not good for the Governing Minnis Administration, which was only elected in the last 22 months. This collapse is indeed unprecedented and has never occurred where a government’s popularity, likability and appeal has so sharply fallen with more than three years to go. This can only get worse. Previous articlePastor says Minnis Administration is CORRUPT! Next articleHOW MUCH LONGER DO WE HAVE TO WAIT FOR A HEALTH CARE SYSTEM THAT SERVES THE PUBLIC GOOD?